David Hogg, a senior at Marjory Stoneman Douglas High School, speaks at a rally calling for tighter gun control three days after the shooting at his school in South Florida. In the days since a gunman opened fire on their classmates on Valentine's Day, killing 17 people just as school was about to end for the day, a group of outraged teenage survivors have been vocally demanding stricter gun laws. In response to their activism, right-wing outlets have contrived and pushed false reports that the students are actors capitalizing on the tragedy to push a liberal agenda on gun control. These fake claims have now gone viral. Hundreds of videos, articles, and posts claiming to unmask these fake students have swept across social media, gaining thousands of views, shares, and retweets. The content picks apart the students' performances in media interviews as they talked about the friends they lost in the shooting at Marjory Stoneman Douglas High School and their anger that the tragedy happened at another US school. As of Tuesday night, 108,135 people were talking about "crisis actors" on Facebook. One video had been watched more than 41,000 times and shared by about 2,300 users. Before it was removed, another Facebook post calling Stoneman Douglas senior David Hogg an actor was shared more than 110,000 times. Yet another clip posted on Twitter got more than 6,000 retweets. TheGatewayPundit.com, a right-wing news website, also posted a story that noted Hogg's father is a retired FBI agent — a fact the site dubbed a “red flag” — and concluded, without evidence, that the teen had been coached to push anti-Trump talking points. "contained footage from an authoritative news source." "The video should never have appeared in Trending," YouTube said, adding that they had removed the video from Trending and YouTube for "violating our policies." "We are working to improve our systems moving forward," the statement said. However, YouTube did not address questions on why its search results for "David Hogg" list several videos calling Hogg an actor and accusing him of "babbling" rehearsed lines on television interviews. Prominent Trump supporters on Twitter, including former Milwaukee sheriff David Clarke and conservative author Dinesh D'Souza, have also been peddling the conspiracy theory that the students' push for gun reform is an orchestrated political effort by the left-wing. Clarke tweeted, without evidence, that liberal billionaire philanthropist George Soros was backing the teens' activism and demand for gun reform. D'Souza called one of the survivors of the shooting "deranged" and suggested that she had been "coached" to propagate anti-Trump views on television. He also said that the students' grief over losing their peers was "politically orchestrated," "phony," and "inauthentic." D'Souza apologized for the "insensitive" tweet Wednesday that was still up on his page. BuzzFeed News reached out to Twitter to ask if D'Souza will continue to remain a verified user. Right-wing talk show host Alex Jones published several videos on his InfoWars YouTube channel also accusing Hogg of forgetting his lines during a TV interview. One video has now been watched more than 9,200 times and has sparked dozens of copycat takes. Another video claiming that the Florida school shooting was a "giant false flag" has 170,000 views. The channel has more than 2 million subscribers. In response to an inquiry about videos, a spokesperson for YouTube referred BuzzFeed News to the company's harassment policy. "We recognize the challenging issues presented by hoax videos and the pain they can cause the families who have suffered these incredibly tragic losses," the spokesperson said. "That is why last summer we updated the application of our harassment policy to include hoax videos that target the victims of these tragedies. Any video flagged to us that violates this policy is reviewed and then removed." A spokesperson for Facebook said that the company was "aware" of the posts related to the Florida shooting conspiracies, but said that the company doesn't "have policies in place that require people to tell the truth." "People often make unverified claims about people and events ('the minister is corrupt!' 'I found a roach in my soup at that restaurant! '), and determining what’s true and false (versus what’s opinion, hoax, hyperbole, etc.) isn't something we can do reliably in specific cases or at scale," the spokesperson said, noting that there are "valid concerns about a private company being an arbiter of truth." "When potentially false content has been flagged to us, we send it to our third party fact checkers," he said. "If the fact checking organizations identify a story as fake, we will suggest related articles in News Feed to show people different points of view, including information from fact checkers. Stories that have been disputed may also appear lower in News Feed." Meanwhile, the fringe conspiracy theories have seeped into official channels. An aide to a Florida state lawmaker was fired Tuesday after pushing the crisis actor theory. Florida state Rep. Shawn Harrison said on Twitter that he decided to fire his district secretary, Benjamin Kelly, for making "an insensitive and inappropriate allegation about Parkland students." The Republican also stressed that he did not share Kelly's views. "Both kids in the picture are not students here but actors that travel to various crisis when they happen," Kelly wrote, according to the paper's Washington bureau chief, Alex Leary. In a statement posted on Twitter before he took down the account, Kelly apologized for emailing the reporter but defended the theory about the shooting survivors, saying that he was fired when he "tried to inform a reporter of information relating to his story regarding a school shooting." Meanwhile, a former Georgia Republican lawmaker keeps insisting that Democrats are using the Stoneman Douglas students as puppets to force US politicians to put new limits on gun ownership. And President Donald Trump's eldest son, Donald Trump Jr., liked two tweets propagating the false theories about the teen school shooting survivors. On Facebook, a video titled, "Crisis Actors from LA to Parkland" garnered 38,000 views in about 10 hours. On Twitter, a pro-Trump user named @ChristiChat, who has more than 260,000 followers, repeatedly pushed the false claim that Hogg is an actor. One of her videos was retweeted at least 6,200 times. 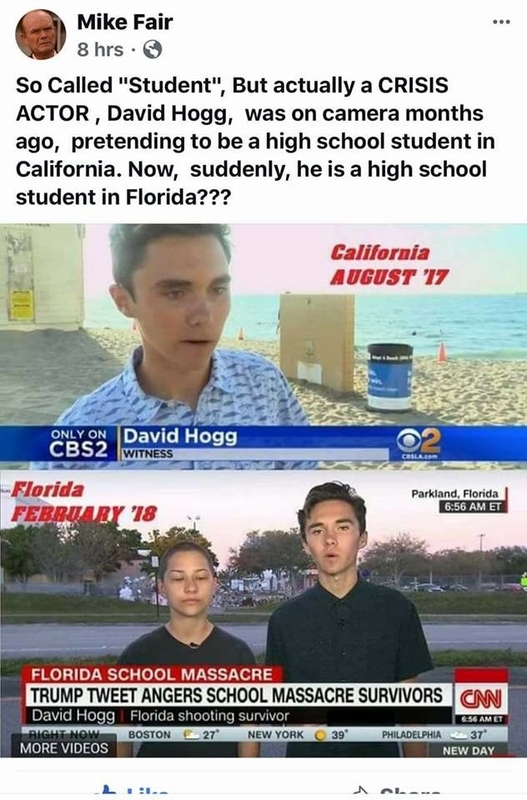 Hogg had tweeted last summer about visiting California, and also shared the CBS video he appeared in. "Only after a week in LA I've made a youtube video with over half a million views and got on the news," he said on Aug. 8. Other far-right figures have seized on Emma González — another Stoneman Douglas student, whose speech at a rally for gun control went viral Saturday — and have pushed false theories that she "was coached" and that Democrats are using her as a pawn to promote their agenda. Students, school officials, and Florida lawmakers have pushed back against the conspiracy theories. Broward County Schools Superintendent Robert Runcie slammed the rumors that the teens were "crisis actors," telling the Tampa Bay Times that they "are absolutely students at Stoneman Douglas." "They've been there," Runcie said. "I can verify that." In a tweet, US Sen. Marco Rubio called those who fabricated the theory "a disgusting group of idiots with no sense of decency." In response to Kelly's comments to the Tampa Bay Times, Florida House Speaker Richard Corcoran said he was "shocked and angry to read the appalling email about the brave students" and explained that he was the one who terminated the aide. The conspiracy theories really gained steam Tuesday, as a group of the teen survivors turned activists traveled to Tallahassee to meet with lawmakers in Florida's state capitol about gun control. The teens' nascent movement, dubbed Never Again MSD, has already amassed more than $1 million in donations from celebrities like George Clooney and Oprah. Incensed by the rumors about them, the students fired back on social media, emphasizing that they are in fact kids "who feared for our lives while someone shot up our school." "I want to go to school for musical theatre," Stoneman Douglas senior Diego Pfeiffer told CNN Tuesday. "I would love to be an actor. No joke. But the people who are no longer here, they are not acting. They are dead." "To have other people tell me that my grief is not real, that I am just acting it out — I would love to be that good of an actor but I'm not," Pfeiffer continued. "This is real." On the bus with student activists traveling to Tallahassee Tuesday, CNN asked another teenager what she thought about far-right websites spreading the baseless theories that Hogg and others are pretending to grieve and be angry. "Honestly, I think the reason people are saying those things is they’re in disbelief and they’re scared because there are 17-year-old kids who are way smarter than them," the student, Sofie Whitney, replied. 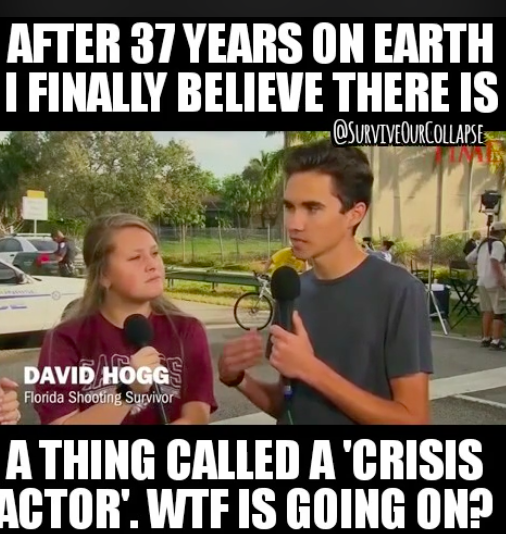 "David Hogg is not a crisis actor, I promise."